A press statement from the prison strike media team, discussing coverage so far and giving a round-up of confirmed actions. This is a growing movement and the Nationwide Prison Strike of 2018 is an unparalleled success for prisoner organizing in the modern era. However, it is important that in recognizing that success that we not lose sight of the demands that prisoners have laid out. Each of them is crucial. As the continued prisoner-on-prisoner violence within prisons over the past week suggests, the people who run the US prison system have not yet made the necessary changes to stop the violence they produce behind the walls. These are changes which are necessary to ensure that prisoners are safe, that they have can have hopes and dreams for the future, that they can build towards redemption, rather than being condemned to a slow death inside a concrete box. Right now we know that thousands of prisoners are risking torturous repression to bring this agenda forward, and we do not take their sacrifice lightly and neither should you. Prisoners are facing repression right now as we speak and it is our duty on the outside to do whatever we can to shield them from that violence of the state. 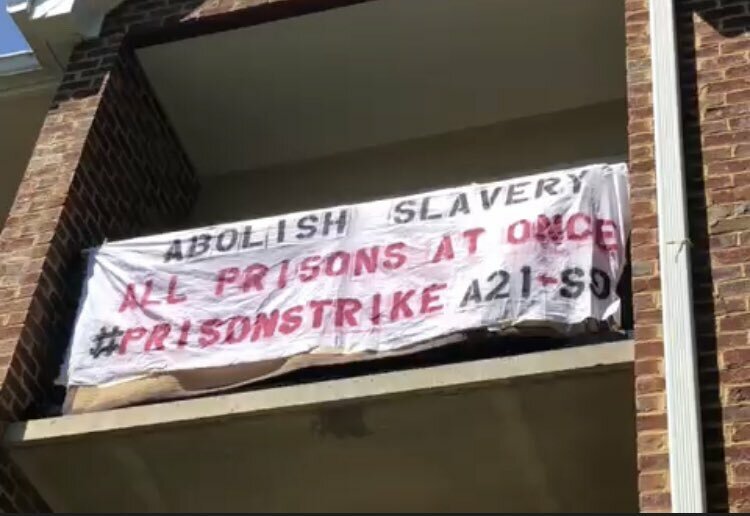 We have had incidents where media have had the opportunity to interview imprisoned prison strike leadership and have refused to print their words because the prisoner refused to give out his government name out of an understanding of the very real dangers of reprisal. Opportunities to interview prisoners who are connected to the organization of this protest from the inside are precious and we will not squander them again on institutions who don't understand and value what is at risk for prisoners in this moment. The voting rights of all confined citizens serving prison sentences, pretrial detainees, and so-called “ex-felons” must be counted. Representation is demanded. All voices count! As the first week of the prison strike comes to a close, we are seeing the strike spread across the US as the imprisoned organizers predicted. Within prisons, what we see and are able to report on the outside is always only the tip of the iceberg. For every documented form of protest that we are able to share with you, we know there are many others that aren't even on our radar yet. Washington - Representatives of over 200 immigrant detainees at Northwest Detention Center in Tacoma, Washington declared a hunger strike on day one of the national prison strike. Amid fears of retaliation, 70 across three blocks participated. As of this time, seven continue to refuse food into a second week. Georgia - Prisoners in Georgia State Prison "Reidsville" have reported a strike according to Jailhouse Lawyers Speak. South Carolina - Jailhouse Lawyers Speak is reporting that prisoners in the following facilities are on strike: Broad River Correctional Institution, Lee Correctional Institution, McCormick Correctional Institution, Turbeville Correctional Institute, Kershaw Correctional Institution, and Lieber Correctional Institution. The actions in these facilities include widespread workstrikes, with only a few prisoners reporting to their jobs, and commissary boycotts. North Carolina - Prisoners at Hyde Correctional Institution in Swanquarter, NC demonstrated in solidarity with the strike. There have been unconfirmed reports of strikes at other institutions across the state. Ohio - At least two prisoners at Toledo Correctional Institution began a hunger strike on August 21. David Easley and James Ward were moved into isolation for participating and authorities have cut off their means of communication to outside contacts. Indiana - prisoners in the segregation unit at Wabash Valley Correctional Institution initiated a hunger strike on Monday August 27 demanding adequate food and an end to cold temperatures in the unit. New Mexico - On August 9, prisoners at Lea County Correctional Facility in Hobbs, NM organized a work stoppage against conditions at the prison, operated by private corporation GEO Group. Tensions at the prison reached a tipping point prior to the date of the strike and prisoners could not wait before initiating their protest. All facilities in New Mexico were placed on lockdown status on the morning of August 20. This statewide lockdown has since been lifted except for Lea County C.F..
Florida - Jailhouse Lawyers Speak asserts that five Florida facilities are seeing strike activity: Charlotte CI reports 40 refusing work, and 100 boycotting commissary. Prisoners at Dade Correctional say 30-40 on strike, Franklin Correctional report 30-60, Holmes Correctional reports 70, Appalachee Correctional report an unknown number. Nova Scotia, Canada - at Burnside County Jail in Halifax prisoners went on strike and issued a protest statement in solidarity with the strike and naming local demands. They went through a lockdown and extensive negotiations with authorities, those who refused to cooperate with humiliating body scans were punished by being locked in a dry cell (no water or working toilets) for three days. Texas - IWOC was forwarded a message dated 8/23 from inside administrative segregation, (solitary) of Stiles Unit, Beaumont TX confirming that 2 prisoners are on hunger strike in solidarity with the national action: "I feel great. But very hungry! And not because I don't have food but because of our 48 hours solidarity with our brothers and sisters. It's the only way we can show support from inside of Seg. Let everyone know we got their backs." IWOC has confirmed that Robert Uvalle is on hunger strike in solitary at Michael Unit, Anderson County, TX in solidarity with the nationwide strike. Robert has been in solitary for most of his 25 years inside. Prison authorities have begun responding to the strike in media interviews denying that anything unusual is occuring in their facilities. Inside organizers predicted this would happen and urge continued skepticism and investigation. Organizers with Jailhouse Lawyers Speak struggle to rebut these claims because of the need to protect themselves from targeted reprisals. Before the strike started, prisoner leaders in Ohio, Florida and Texas were targeted and isolated. The state’s attempts to pre-empt or deter strike action in some facilities included humiliating and demoralizing rituals. In previous years, prisoners who openly spoke to media suffered greatly for it. For example, Melvin Ray, Dhati Khalid and Kinetik Justice of the Free Alabama Movement were transferred to isolation in 2014 after publicly announcing a work stoppage. Then in 2016, while still in isolation from that incident, they continued to openly advocate the September 9 national strike. Kinetik Justice was sent to notoriously dangerous Kilby and Limestone prisons where he believed authorities intended to kill him, but continued to protest and draw attention, protecting himself from further harm. The efforts by authorities to disrupt communication between prisoner organizers and outside support also interfere with and impede communication between prisons by inside organizers. Before the strike started Jailhouse Lawyers Speak heard commitments to the strike and its demands from prisoners in 17 states. Prison authorities may prove successful in concealing or even deterring participation in some of those states, but they cannot refute the righteousness of the 10 prisoner demands. Outside supporters have and will continue to advocate for the demands with vibrant protests across the United States. Hundreds of rallies, protests, informational events, and other actions have been recorded. Phone zaps to support striking prisoners have seen wide participation. The impact of the strike on policy and public dialog about mass incarceration in the United States will be deep and sustained. There have been many questions about whether the prison strike can be successful. To the first question, the success of the prison strike will not be determined in a simple easily digestible news bite, but by the recognition by enough people with enough power to force society to view prisoners as human beings, and view the concerns of incarcerated humans as legitimate human rights concerns. The strike has clearly already achieved greater success than the 2016 strike, as it has reached publications and milestones that were never reached in 2016. Prisoner demands have permeated the mainstream conversation and they are taking their rightful place at the table in all conversations on how to begin to undo the atrocity that is mass incarceration in America. Organizations are signing on in solidarity faster than organizers can update the endorsement list and by the time we hit the one week mark there are over 300 organizations, and groups officially in solidarity with the prison strike. The full realization of prisoners demands requires broad changes to the prison system and US society. The prisoners’ bold action must be followed up on the outside with policy changes and continuous conversations about living conditions and human rights abuse in the prisons.